The relevant rule (CPR 3.14) provides that unless the court otherwise orders, any party which fails to file a budget despite being required to do so will be treated as having filed a budget comprising only the applicable court fees. Another rule in the CPR gives a party a chance to ask for relief from such sanctions. The Master, who reached the decision originally, was unimpressed by the explanations given by the lawyers – which went along the lines of very busy…short-staffed….barrister did not tell us what he was going to charge.. So no good reason for allowing a late budget to go in. The question for the Court of Appeal was whether this was wrong. In the old days, it would undoubtedly have been set aside, because justice was seen as something to be done between the parties, and the parties alone. Jackson LJ, on the other hand, following his reforming predecessor, Lord Woolf, believes in a wider justice, namely ensuring that other court users are also not affected by the lack of compliance within a given case. The importance of the court having regard to the needs and interests of all court users when case managing in an individual case is well illustrated by what occurred in the present case. If the claimant had complied…the case would have proceeded…. Instead, an adjournment was necessary and the hearing was abortive. In order to accommodate the adjourned hearing within a reasonable time, the Master vacated a half day appointment which had been allocated to deal with claims by persons who had been affected by asbestos-related diseases. So messing up one case messes up other people’s cases as well, and those cases may be really serious ones. was, however, right to focus on the essential elements of the post-Jackson regime. The defaults by the claimant’s solicitors were not minor or trivial and there was no good excuse for them. 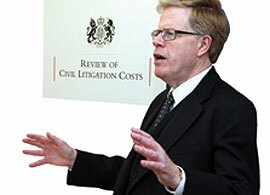 They resulted in an abortive costs budgeting hearing and an adjournment which had serious consequences for other litigants. Although it seems harsh in the individual case of Mr Mitchell’s claim, if we were to overturn the decision to refuse relief, it is inevitable that the attempt to achieve a change in culture would receive a major setback. In so doing, the Court sought to distinguish between trivial non-compliances which might entitle a party to relief, and others where the burden was on the defaulting party, and there had to be good reason for default. And being a bit busy and stretched did not fall into the “good reason” category. All litigators will need to have - of the judgment engraved on their hearts. The CA could not have wished for a better case to make an example of defaulting lawyers. As it pointed out, lawyers have had plenty of warning recently of these changes. But one cannot help thinking that the case has been irremediably skewed by this decision. If The Sun has any plausible evidence that our MP said the fateful words, it can run it without the usual disciplines imposed by costs. It may recover half a million in costs if it wins, and loses what it would regard as small change if it loses. So all very well to scare lawyers witless, but has justice really been done? When does a claim become prohibitively expensive? Surely the costs issue will come to roost with Mitchell’s lawyers and their liability – for not keeping their eyes of the time constraints – rather than the individual himself. That does not seem to be unjust or disproportionate: he has just got to hold their feet to the fire.